The pioneer Alpine (and Himalayan) lightweighter was Fred Mummery, arguably the greatest climber of his generation. With a close set of climbing friends, he enthusiastically pursued guideless climbing in the Alps in the 1890s. His own personal disability may have encouraged him to camp high –he had myopia which made stumbling around in the dark to reach the valley a torture. There was the alternative of the growing network of mountain huts, but in this period these were fairly squalid. Food (unspecified) but may well have included champagne! No question though that Mummery had a lightweight philosophy which he transferred to the Himalayas for his fated Nanga Parbat expedition in 1895. 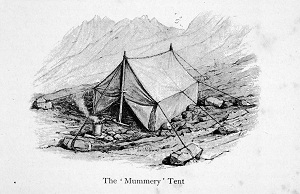 Where Whymper preferred large scale expeditions with meticulous planning Mummery preferred the spontaneity of the ‘back of the envelope’ approach. He was entirely unconventional. In an age of chaperones, he broke all the rules by spending nights in his tent, not just with his two friends Ellis Carr and Cecil Slingsby, but alone with Lily Bristow, the most outstanding female climber of her generation. Longstaff’s experience of lightweight techniques, of high altitude climbing and indeed the Arctic undoubtedly shaped the clothing and equipment used on Everest in the 1920s. He was a member of the 1922 team and was joined on Spitzbergen by Sandy Irvine in 1923. Climbers who favoured a lightweight approach in the mountains included Philip Hope and W.T Kirkpatrick. Like most of their contemporaries they were happy to rely on porters as far as the hut. Over a number of years, before the First World War, they reduced the weight of their loads and ensured clothing was light layers of wool and silk that trapped air for improved insulation. ‘Hope the resourceful reduced mountain outfit to an exact science- he goes very lightly burdened yet can prepare buttered eggs and cocoa on the remotest mountain peak….